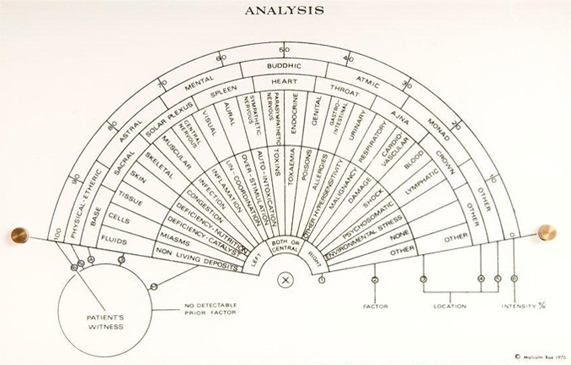 Radionics, the science of healing at a distance using special instruments, is also an art which requires a deep understanding which, as such, takes time to acquire. The College offers a three-year, part-time Diploma course. Tutorials are at a time and a place convenient to the student and the tutor and some weekend seminars are involved. Included in the training are ancillary matters such as how to conduct a practice, administration, law and ethics. Examinations are held throughout the training to ensure that the highest possible standards are maintained. Radionics can only be learnt by means of personal tuition from an experienced practitioner. The College does not therefore provide a correspondence course. Introductory Day courses are held twice a year for potential students and others interested in radionics. No one is accepted for training without having attended one of these courses and being interviewed by a member of the Management Committee of Keys College. For treatment of humans, potential students should have a minimum of 5 GCSEs of at least grade C (or ‘O’-level equivalent), which include Human Biology and English Language, and any two ‘A’ levels. Mature students are considered on their merits but must have Human Biology and English Language GCSE C-grade equivalent or higher. Following full qualification in the treatment of humans, students may go on to take a short supplementary course in the treatment of animals. For the Agriculture/Horticulture course, the requirement is a Certificate in General Agriculture/Horticulture awarded by a recognised Agricultural or Technical College or three years’ recent experience in general agriculture/horticulture supported by references. The Keys College of Radionics is affiliated to the Institute of Complementary and Natural Medicine (ICNM). Qualified practitioners are therefore entitled to register with the British Register of Complementary Practitioners (BRCP), which is administered by the ICNM. Among the benefits of membership is liability insurance. For more information and a full Training Prospectus please click on the link or contact us.